In this tutorial, you’ll learn how to use Godot’s InputEvent system to capture player input. There are many different types of input your game may use - keyboard, gamepad, mouse, etc. - and many different ways to turn those inputs into actions in your game. This document will show you some of the most common scenarios, which you can use as starting points for your own projects. 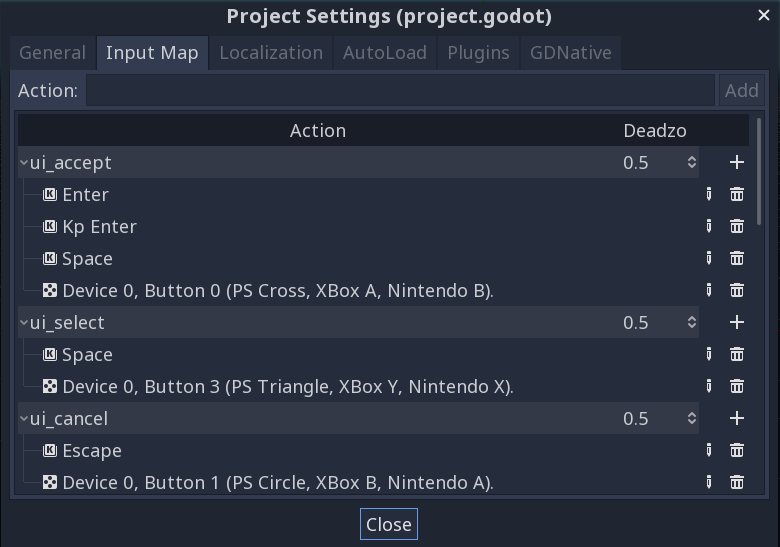 For a detailed overview of how Godot’s input event system works, see InputEvent. Sometimes you want your game to respond to a certain input event - pressing the “jump” button, for example. For other situations, you might want something to happen as long as a key is pressed, such as movement. In the first case, you can use the _input() function, which will be called whenever an input event occurs. In the second case, Godot provides the Input singleton, which you can use to query the state of an input. This gives you the flexibility to mix-and-match the type of input processing you do. For the remainder of this tutorial, we’ll focus on capturing individual events in _input(). InputEventWithModifiers - adds the ability to check if modifiers are pressed, such as Shift or Alt. InputEventMouseButton - contains the index of the button that was pressed, whether it was a double-click, etc. It’s a good idea to keep the class reference open while you’re working with events so you can check the event type’s available properties and methods. See @GlobalScope_KeyList for a list of scancode constants. Mouse events stem from the InputEventMouse class, and are separated into two types: InputEventMouseButton and InputEventMouseMotion. Note that this means that all mouse events will contain a position property. Capturing mouse buttons is very similar to handling key events. @GlobalScope_ButtonList contains a list of BUTTON_* constants for each possible button, which will be reported in the event’s button_index property. Note that the scrollwheel also counts as a button - two buttons, to be precise, with both BUTTON_WHEEL_UP and BUTTON_WHEEL_DOWN being separate events. InputEventMouseMotion events occur whenever the mouse moves. You can find the move’s distance with the relative property. # Start dragging if the click is on the sprite. # Stop dragging if the button is released. # While dragging, move the sprite with the mouse. If you are using a touchscreen device, you can generate touch events. InputEventScreenTouch is equivalent to a mouse click event, and InputEventScreenDrag works much the same as mouse motion. To test your touch events on a non-touchscreen device, open Project Settings and go to the “Input Devices/Pointing” section. Enable “Emulate Touch From Mouse” and your project will interpret mouse clicks and motion as touch events.